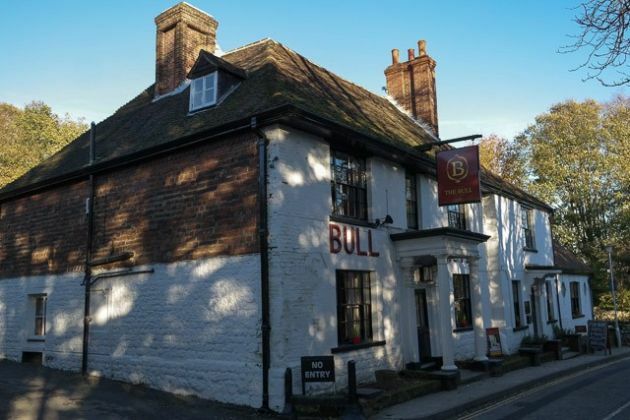 The Bull Hotel is situated in a wonderful country village of Wrotham, near Brands Hatch. Booking through their website for Sunday lunch was simple, and I was able to put in the request for a high chair and also a table close to the window. A drive through country roads off the M20, and some beautiful scenery, we arrived at The Bull Hotel in time for lunch. A large car park behind the pub meant we could easily park without issues. Through a couple of sets of double doors and we entered the pub area. We were met almost immediately, and shown to our table (it was quite obvious which one it was – the one with the high chair!). I was really pleased with my choice of venue to meet Claire’s Mum (Yve) and husband (Bob) for lunch. A fire places at the end of each room, some comfy seating areas for people to relax in, large windows next to our table, and cutlery, glasses etc all laid out for us. There were some wonderful pencil drawings on one wall, some of which were for sale. The waitress helped with the high chair – very much appreciated as it made Claire feel more relaxed that John William was welcome instead of a hindrance. Drinks order was taken – diet coke all round apart from me, I had a Camden Brewery Wit Beer (which was very enjoyable). I glanced at the wine selection – a huge choice, ranging from £18ish upwards. 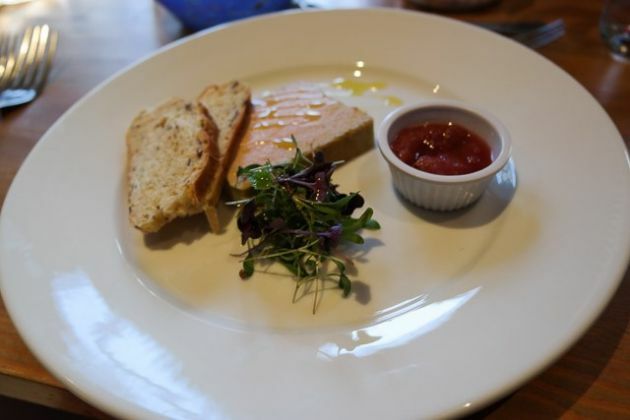 We each ordered starters along with our main courses: Yve – Salmon, then Roast Chicken, Claire – Liver Parfait, Roast Pork Belly, Bob – Liver Parfait, Roast Chicken, Me: Oxtail Croquettes, Roast Lamb. The starters were each priced around £7.50. Starters came out after about 10-15 mins of ordering, they looked impressive! 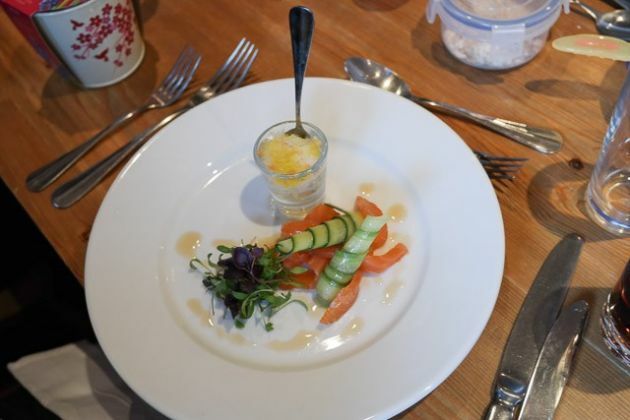 My oxtail croquettes were floating in a thick soup, the Liver Parfait had two slices of saffron bread as well as some salad, and the salmon had a small shot glass of something. 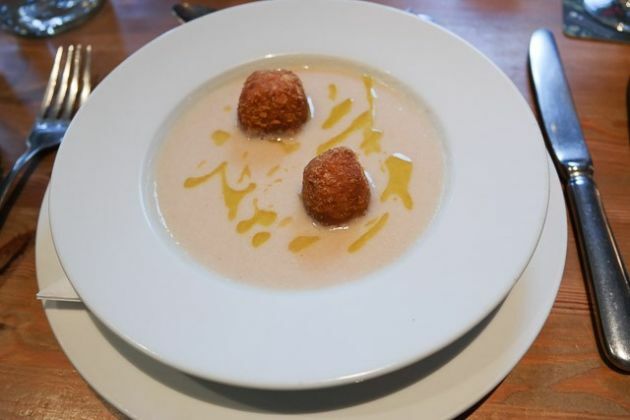 I’m so pleased I am getting more adventurous with my menu choices, the oxtail croquettes and soup were excellent. Claire enjoyed the parfait, but did remark that there wasn’t much bread to eat it with. Yve was also pleased with the salmon. Main courses were served quickly after the starters were finished. Once again, presentation was high. I had a large “roll” of lamb, 3 nice sized roast potatoes and vegetables. A simple looking, but effective dish. Claire had a large slice of pork belly (with crackling), and it looked like a chicken supreme for Yve and Bob. 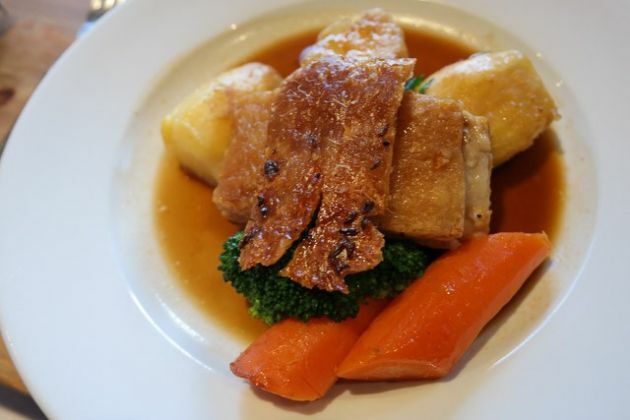 I tried some of Claire’s pork belly – again, superb! As it had been cooked properly, the meat was so tender and delicate. The (large) crackling was excellent. The roast potatoes were excellent, a good crunch with . The vegetables consisted of carrots, broccoli and cabbage. All cooked al dente and very much to my liking. So, an excellent lunch in another class from most other roasts we have had. We just had to try the desserts! Claire, once again, decided against a pudding but ordered a coffee instead. Yve asked for the rice pudding with figs, Bob ordered the bread & butter pudding and I (after asking the waiter what he recommended) went for the creme brulee with cardamon shortbread biscuit and a cappuccino. All desserts (apart from the cheeses) were £5.95. The desserts were brought out soon after ordering. Each, once again, looked great. 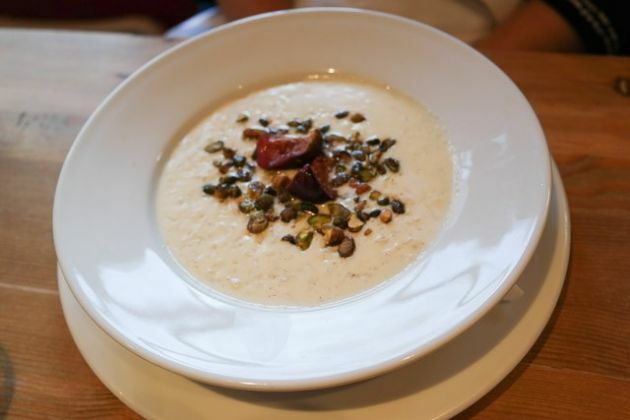 Yve’s rice pudding had slices of roast fig in the middle with peanut brittle sprinkled around, she was pleased with it. 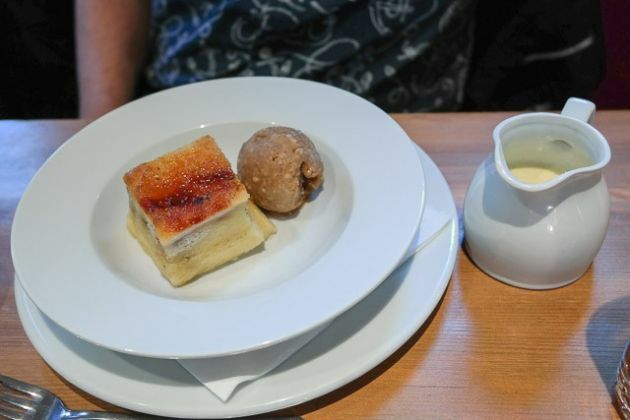 The bread and butter pudding had a scoop of (actual) banana ice cream with a jug of custard (sorry, “crème anglaise”) and, again, Bob was happy. 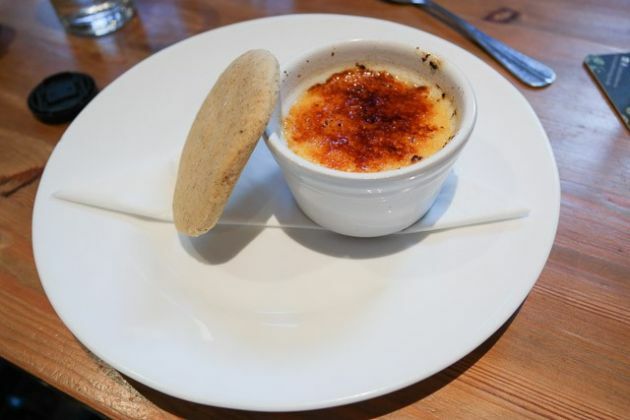 My crème brulee was cooked well – the vanilla pods seemed to be in the bottom of the dish instead of throughout the brulee which probably would have been a small mark down if this was Masterchef, but I definitely enjoyed it. Also, the cardamom biscuit had a nice spicy taste, which went well with the vanilla flavoured biscuit. 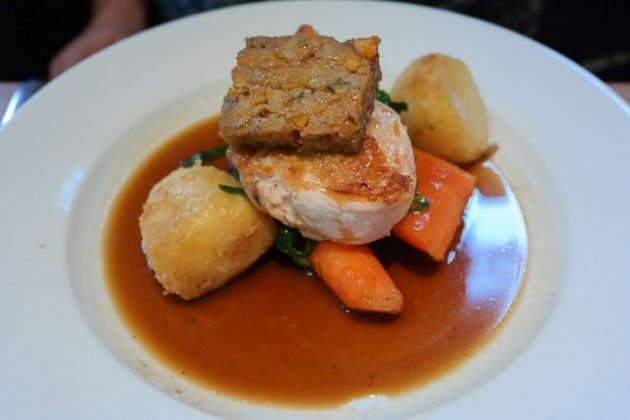 So, all in all, a fantastic Sunday roast at The Bull Hotel. The food quality, taste and presentation was superb. The meat was excellent, especially the tender lamb; our desserts were just as good as the main. One small point – I would have liked the bill to have been printed and itemised so we could have checked everything was correct. The service was excellent, helpful, friendly and polite. As mentioned previously, John William (our 9 month baby) was accommodated without any fuss (in fact, we felt welcome with him). It was a shame they didn’t have any baby changing facilities, but I was able to change him in a private room (which was good of them to find for me). I would love to visit the pub with friends during Christmas, the country inn could certainly suit decorations – especially the mantelpieces above the fire places. 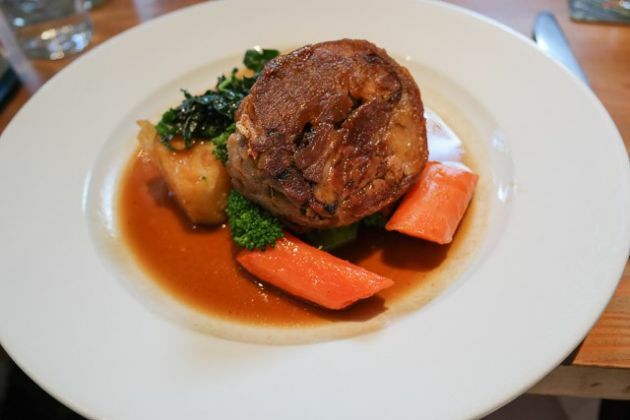 So, it’s without hesitation that Sunday lunch at The Bull Hotel in Wrotham, Sevenoaks receives our top rated aware – 5/5 plates.